I will start right off by saying that this was not exactly my favorite Supernatural episode and judging from my timeline on show night and from other reviews, I feel safe to say that I am not alone in my opinion. I could fill this article with a list of all the things I thought did not work, but instead I will begin with what I did like about Paint it Black, written by Eugenie Ross Leming and Brad Buckner and directed by John Showalter. To first recap this week’s two tiered plot; in one, Sam and Dean go on a hunt, once again to keep Dean’s mind on the ball and off the Mark. 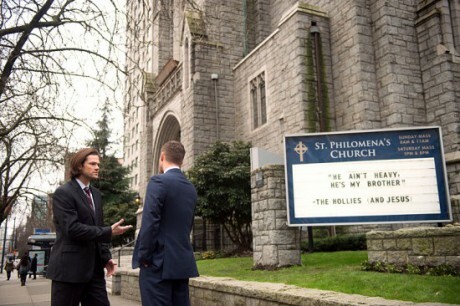 Some strange deaths bring the boys to a church in Massachusetts (via the Vancouver church also used as a location in Houses of the Holy S2.13), where it seems that men who confess about cheating on their partners end up skewered in horrific fashion. As the boys investigate they find the vengeful ghost of a 16th century nun who, once betrayed, stabbed her artist-beloved to death and now exacts revenge via possession of the confessional. Her blood and bones literally mixed into her portrait, the only way to sever her earthly ties is to torch the painting of her image. In the second story, Crowley finally brings Rowena the witch who banned his mother from the grand coven so long ago. As Rowena beats Olivette (Teryl Rothery), she finds out that the coven lost all spells and potions long ago to a society of do-gooders with effective PR. The witches’ treasures are spread among a network of warded bunkers and only two members of this secret Men of Letters society remain; Sam and Dean Winchester. Once again, this MOTW episode brought us lots of gore and dark color tones and shadows. The sets and locations were magnificent, with designer Jerry Wanek outdoing himself once again with a taste of 16th century Italy. The Supernatural VFX team also delivered with ghostly apparitions and views of the city of Florence. 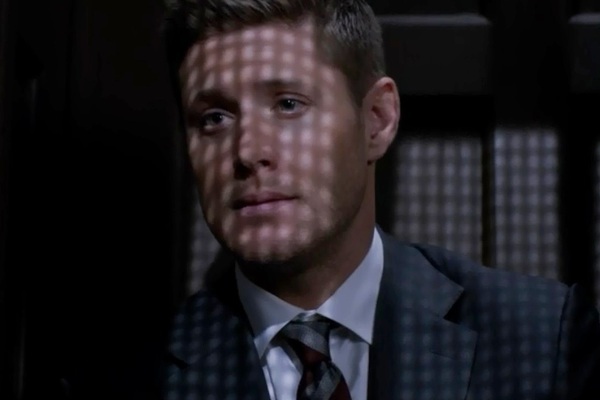 Cinematographer Serge Ladouceur managed to make Jensen Ackles look even more beautiful than usual with some spectacular lighting in Dean’s confessional scene. Mr. Ackles hit it out of the park when his fake confession, meant to lure the vengeful spirit, turned into a beautiful moment of rare Dean Winchester vulnerability. This is the second time in recent episodes that Dean openly confessed his fear. This time around he added some notes of regret and perhaps even hope of redemption. He wished for more time to experience his life in a different, more feeling way. Sam is still very much determined to save his brother and in the end scene in the Impala he implored Dean to get on board with believing a cure was possible. It was great to finally hear Sam say that he too had been in a place where he had used hunting as an escape and so could relate to Dean wanting to do the same. I have been waiting to hear Sam use his own experiences and tortured past to connect with Dean. And how wonderful to see our smart Sam in action when he decided to go against Dean’s orders to burn the diary and read it instead; written in old Italian (or maybe Latin) no less! I would be amiss to completely overlook why this episode just did not work for me. In short, I simply found it boring. The nun’s backstory took up way too much screen time and slowed the story to a crawl. The acting in those scenes was questionable at best and the love story was a little silly and out of place. And though I adore Ruth Connell, Rowena continues to be an off note for me. The character is sometimes too over the top for the tone of the rest of the show and the whole storyline has managed to make Crowley mostly disappear. Quite a feat considering he is brought to life by someone as charismatic as Mark Sheppard. The Men of Letters connection finally tied the characters together, but I am not sure that I was hoping for a battle for the bunker for the last few episodes leading up to the season finale. Instead I would rather see the focus on the Mark and the rich, deeply personal story that was set up so beautifully in the Executioner’s Song. This season has seen some excellent episodes; from gripping myth arc ones to clever MOTWs. Paint it Black had far too few scenes with Sam and Dean and I hope that as we head to the end of season 10, the focus sharpens, rather than sees it scatter even more among the separate storylines and characters. The preview of next week’s episode, Inside Man, showed the already widely spoiled return of a beloved character. From what we can see, the action is ramping up and Dean’s condition is getting worse. I am ready to forget about this week’s missteps and look forward to seeing what comes next!